This year when we're out holiday shopping we like to stop for a bite to eat. You'll often find us inside places like P.F. Changs. Not only are the meals delicious but they even have something for the kiddos too! This holiday season give the gift of a date night or a great meal with P.F. Chang's. When you purchase $100 in gift cards at P.F. Chang’s you get an extra $20 for yourself! So give thee gift of a delicious meals at P.F. Chang's and treat yourself too. Be sure to Follow P.F. Chang’s on Pinterest and Follow @pfchangs on twitter to stay connected! Who in your inner circle is deserving of a night out with a P.F. 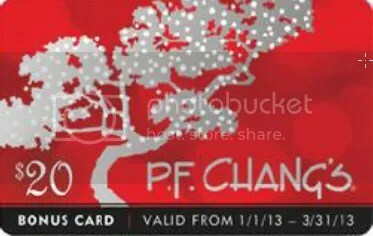 Chang's gift card? Pumpkin wontons?! I must have some! This would be a great girls night out to get away from the holiday stress.